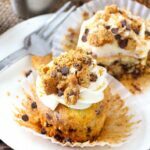 These super moist chocolate chip cupcakes with cream cheese buttercream frosting and chocolate chip cookie crumbs reign supreme in the dessert world. Soft, fluffy, and bursting with buttery flavor. These chocolate chip cupcakes are the absolute BEST! And after you try this chocolate chip cupcakes recipe, make sure to try these banana cupcakes, these pumpkin cupcakes, and these carrot cake cupcakes! I’m excited to be sharing one of our family’s favorite desserts: Chocolate Chip Cookie Cupcakes. These are such a fun mashup of chocolate chip cookies and cupcakes — I mean, chocolate chip cookies and cupcakes were meant to be together. A really good cupcake is pretty hard to pass up… but adding that luscious cream cheese frosting and chocolate chip cookie crumbs on top — takes right over the top. These cupcakes were inspired by our favorite cupcakes at a local bakery “Milk & Cookies” is what they are called, but they should be called “Cookie Monster Dreams” because these are a cookie-lover’s dream! The cupcake base is made of a classic yellow cake batter with mini chocolate chips mixed in. Not just any cake batter though, this cake is so rich, tender and incredibly moist. 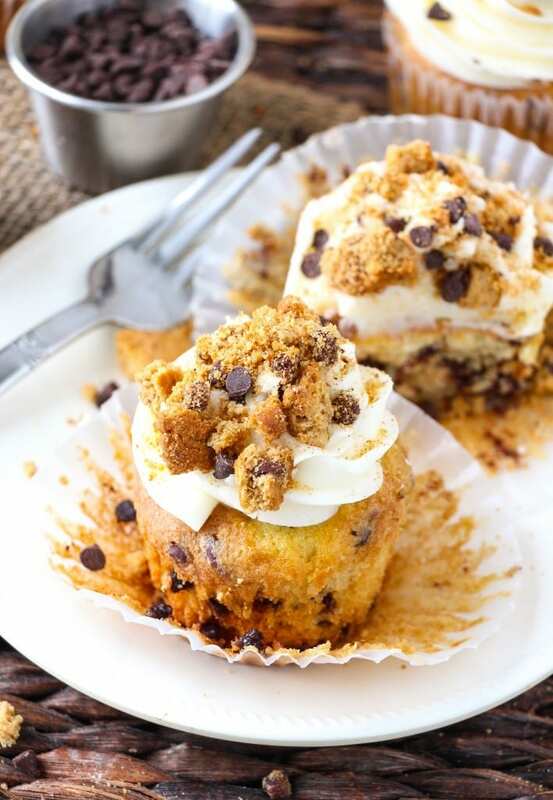 The cupcake then gets topped off with a cream cheese frosting for a little extra richness, and chocolate chip cookie crumbs for a little extra pizzazz. Each bite completely melts in your mouth. I used store bought cookies and crumbled them into crumbs, but if you are have cookies lying around, use those to crumble on top. You don’t have to top these chocolate chip cookie cupcakes with the crumbs of cookies, but it makes for a festive and delicious garnish. Use the best ingredients you have available — the better ingredients you use, the better your end product! Don’t overmix the batter. Over Mixing the batter will result in denser muffins. Bake these chocolate chip cupcakes in the center of your oven. Allow the cupcakes to cool completely before frosting to avoid melted puddles of frosting! Be sure to check out this article for more tips! These super moist chocolate chip yellow cupcakes with cream cheese buttercream frosting and chocolate chip cookie crumbs reign supreme in the dessert world. Soft, fluffy, and bursting with buttery flavor. These chocolate chip cupcakes are the absolute BEST! In a medium bowl, combine flour, baking powder, baking soda, and salt. Slowly add flour mixture to sugar egg mixture one cup at a time. Add extract and beat just until combined. Fold in chocolate chips. Spoon batter evenly into prepared muffin cups. Bake for 18-20 minutes until a toothpick comes out clean. Be careful not to under bake cupcakes. Under baking cupcakes will cause the center to sink in. In a large bowl, beat together the butter and cream cheese with a mixer fitted with the paddle attachment. With the mixer on low speed, add the powdered sugar a cup at a time until smooth and creamy. Beat in the vanilla extract. Fold in about 1/2 cup chocolate chip cookie crumbs. Frost cupcakes and top with remaining cookie crumbs. Oh my goodness these look divine! I have all ingredients on hand except for the shortening. 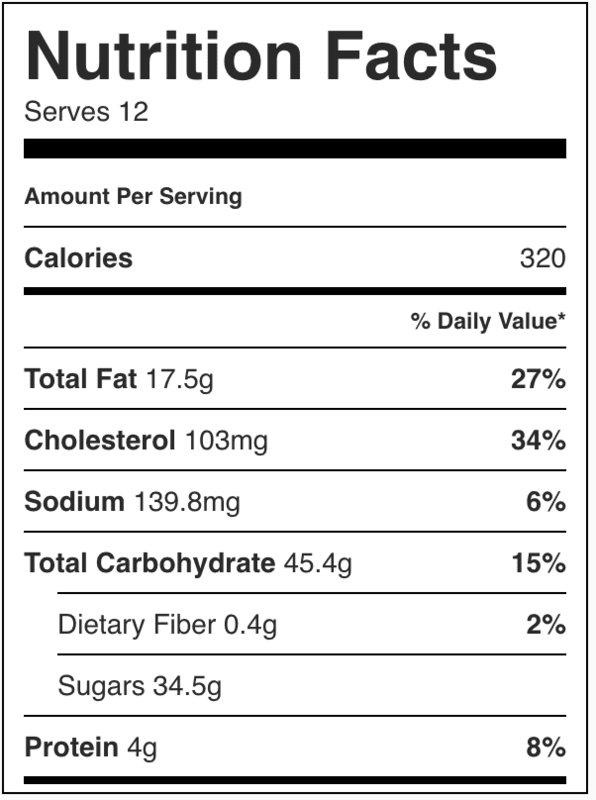 Would extra butter in place of the shortening change the texture of the cupcakes? This looks like the best of both worlds: cupcakes and cookies! Such a great idea! Oh wow – you’ve combined my 2 favourite things ever into one epic dessert!! These are the cutest cupcakes, Chelsea! I love that you combined my favorite cookie in cake form. Sounds delicious! Oh my gosh!!! These look amazing! Those cookie crumbles make for an awesome looking cupcake! sooooooooooo buttery and the perfect combo of cookies and cupcakes! These chocolate chip cupcakes look beautiful and I’m sure delicious! I am totally up for a mash up recipe especially mixing two of my favorite desserts…cookies and cupcakes. Brilliant! Oh Gosh, these are so adorable! Love these cupcakes, Chelsea! Sounds delicious! These cupcakes are too cute, Emily and Chelsea! Chocolate chip cookies are a favorite but in cupcake form they sound simply irresistible! Love the cookie crumble topping too! I’m pinning these right now. Perfection! I love these so much!!! Like really really love! So my four year old really wanted chocolate chip cupcakes for her birthday celebration at school. I came across this recipe & thought how perfect it sounded for a classroom of four & five year olds (& the adults in the room). I doubled this recipe & it made close to 36 cupcakes. I made sure to refridgerate the frosting before spreading it on the completely cooled cupcakes. Honestly, I was afraid that the two tablespoons of almond extract would make it too almond forward… rest assure, my family LOVED these…. as did my neighbors… as I’m sure the kids in my daughter’s class will… Thank you! Yay!! I’m so thrilled everyone enjoyed these cupcakes! I appreciate your comment Jaimie! Made these for my niece’s birthday. My middles fell a bit and the chips sank to the bottom. I rolled them is flour.. I’m thinking the temp in my oven is off. That being said- The taste and texture of these were WONDERFUL! A little dense (which is what I like), moist, just great! Made two dozen, guest took home the few left overs. Lots of compliments on these. Definatly going to make them again. Hi Gina! I am so thrilled to hear these were a hit! 🙂 I love hearing that! Thanks so much for the comment 🙂 And if you get your oven calibrated, it might help with the middles not sinking in. Or perhaps check to make sure your baking agents are fresh. Thanks again!